Nothing on the scale of rescue jobs required by the Sounders of years past quite compares to what’s in store for Peruvian striker Raul Ruidiaz. The last time the Sounders acquired a mid-season designated player, importing Nicolas Lodeiro two years ago this month from Boca Juniors in Argentina, the external commentary was more about questioning his high cost than espousing any genuine belief he’d save the season. But Lodeiro confounded the early doubters and did indeed spark a season-changing rally – some dubbed it “historic” – that drove the Sounders to their first and only championship. And largely as a result, nobody is quibbling this time about the $14 million committed for Ruidiaz, cleared to debut Sunday on the road against Atlanta United FC. Instead, that Lodeiro-inspired comeback in 2016, plus a stellar second half run by the Sounders in 2017, has limited all debate surrounding Ruidiaz to whether he’s enough to immediately alter the course of this year’s dismal 4-9-4 campaign. Schmetzer said he’s constantly reminding people that “it’s a team sport” and players besides Ruidiaz must do their part for the Sounders to go anywhere. Fair or not, Schmetzer knows there’s lots riding on Sunday’s match, expected to occur in front of more than 70,000 fans at Mercedes Benz Stadium and a huge national television audience on FOX as it immediately follows the Croatia-France World Cup final. An upset Sounders victory could provide the spark for the abrupt turnaround needed to salvage a record 10thconsecutive playoff appearance. For now, Ruidiaz remains the only new player joining the worst-scoring team in Major League Soccer. As for World Cup returnees, center back Roman Torres, who this past week said his sprained ankle is healing “little by little” did not make the trip. Midfielder Gustav Svensson has rejoined the team, but it’s unclear how mentally ready he is to contribute right away. That leaves it to Ruidiaz to change the dynamic and expected outcome against an Atlanta squad leading this year’s Supporters Shield race. Schmetzer won’t say whether Ruidiaz will start, or come off the bench. But no matter how he features, he’ll instantly face more pressure than Clint Dempsey did joining a playoff-bound Sounders team in mid-2013, even though that debut was a home match against the hated Portland Timbers. Also more pressure than Obafemi Martins faced debuting for that same 2013 club at the beginning of the year. Lodeiro never had that pressure in 2016, simply because so few back then expected the Sounders to make the playoffs after the mid-season hole they’d dug. Not like with Ruidiaz, who inherits the jersey of a team with just 16 points and 15 goals in 17 matches. Should the Sounders lose as expected Sunday, they risk falling double-digit points behind multiple teams in the race for the final Western Conference playoff spot. Even another unexpected draw like at New England last weekend – giving the Sounders four points of a possible six to start this stretch of three straight road matches — could leave them in the same precarious position or worse. And yet, as improbable as another Sounders turnaround might be, fans and pundits are conditioned to expect them from this team. And Ruidiaz is now expected to lead the latest “historic” annual charge. Sounders goalkeerper Stefan Frei told reporters his team must “aim higher’’ than a draw this time. 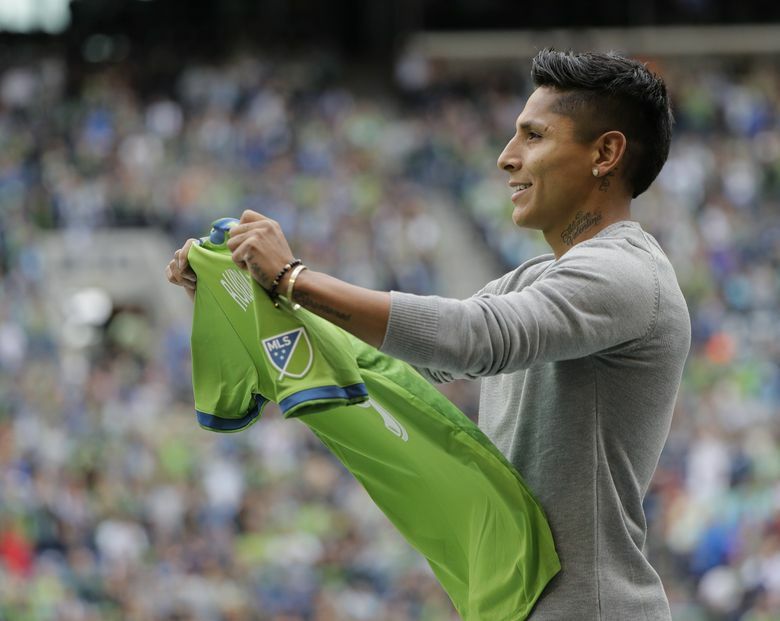 Ruidiaz is the only reinforcement general manager Garth Lagerwey has supplied thus far amid pledges at least one more is on the way. The sooner, the better. By the time the transfer window closes, the Sounders will have just a dozen games remaining. For now, it’s up to the only new one added to get the proverbial ball rolling – preferably into an opponent’s net.